The new term brought great news to St. Louis Infant school. 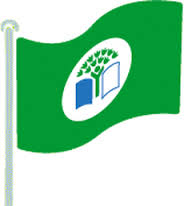 On Thursday, the 12th April Mrs. Greenan received a letter from An Taisce informing her that our application for the International Green Flag award was successful. This is our 4th award in St. Louis Infant School and a big congratulations to all, especially the Green-School Committee, Mrs Greenan, Ms Hughes, Ms Boylan, Kevin Clerkin, Cáitlín, Ryan, Elinga, Faustas, Jacob, Aleksandra, Jayden, Jan, Jessica, Zoe and Ugne. Friday afternoon brought another surprise for the committee. Mrs McCarroll organised a little celebratory buffet in the staffroom. A great time was had by all. Thank you Mrs McCarroll. The children in St Louis Infants are no strangers to the Greenschools programme having been awarded flags for the themes of Litter and Waste, Energy, Water. They have now set their sights on “travel”. This theme is significant for all of us not just in relation to the environment but for our personal health and well being. In recent years our travel habits have been changing. The 2011 census tell us that only 25% of primary school children walk to school compared to 50% in 1981. Encouraging children to use “sustainable” travel to school. This includes walking (always with an adult as our children are very young). Carpooling if walking is not possible. Park/Stride. Quite a few people are doing this already. You can always leave your car a little bit away and walk the rest. Travel by bus if it suits. If you are into cycling or scooting why not? But make sure your child wears a helmet and is supervised at all times by you. The aim of the Green school programme in St Louis Infants is to encourage parents, children and teachers to walk to school, Carpool, Park/Stride or take the bus instead of using single car travel. Our new travel committee had our first meeting and outing on 15/11/16. A very big welcome to our new committee members from the first and Senior Infant classes. Welcome to Clodagh Mc Kenna , Connel Mc Crudden, Síomha Ronaghan, Mya Lynch, Elinga Mukasejevcuite, Caitlin O’ Brien, Faustas Rudys and Ryan Lynch. Our new Travel committee will have the awesome task of promoting sustainable travel within the school community and beyond. The work also involves maintenance of previous themes Litter, Energy and Water. On the 22/11/16 we went out on our walkability audit. The purpose of the audit is to assess how pedestrian friendly a particular route is. The route we chose was from St Louis Infant school to Mc Nally’s car park via the roundabout car park returning via the Clones road. We chose this route as a possible park /stride location. We found that over all the route was reasonably friendly to young children provided they were accompanied by a responsible adult. We had ample supervision on the day from Mrs Greenan, Miss Rocks, Miss Burns, and Miss Lynch. There was lots to notice on such a short route many of which were positive. The winter shrubs were beautiful as well as the wonderful view into the convent park. However the footpath along the roundabout car park is in need of repair. Unfortunately there was some litter to be seen.